The USB Hamlet HUSBSCR is designed for PC application with large numbers of user needing smart card enabled security using a reliable, cost-effective reader. It is compliant with ISO 7816, PC/SC, and Microsoft Plug and Play specification. 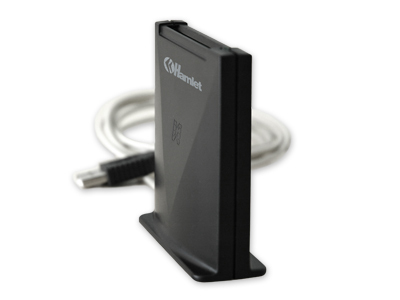 Small portable smart card reader allows you to carry this reader with you and make connections simple and easy. Compliance with ISO7816 -1/2/3/4. Compliance with Microsoft Plug & Play COM device 1.0. Read /Write ISO 7816 asynchronous smart card T=0 and T=1 protocols. Card insertion and removal detection. Short-circuit protection, protects smart card and reader. Power consumption: +5V 15mA(max), compliant with ISO7816 & EMV. Support device driver for Windows95/98, NT4.0, Win2000.